Joseph is a fruitful vine near a spring, whose branches climb over a wall. Genesis 49.22. Though his father, Israel (a.k.a Jacob) uses the term “wall” figuratively, if you know the story of Joseph, you will know that he spent some long hours surrounded by walls, walls that must have made his heart sink. There were the walls of a deep well where his brothers threw him and left him to die, the walls of slavehouses where he was held until the day he sold to Potiphar, and the walls of the deep dungeons of the Egyptian prison. But he grew up and over them all! His father’s poetic blessing expresses his admiration of Joseph’s courage and also a prophetic declaration. Joseph’s ability to overcome so much hardship in his life prefigures the overcoming power and courage that is ours when we trust Christ, just as Joseph trusted in God. The Apostle Paul’s prayer from Colossians 1.9-11 reminds us of the purpose and plan in our life. He asks God to fill you with the knowledge of his will through all spiritual wisdom and understanding. And we pray this in order that you may live a life worthy of the Lord and may please him in every good work, growing in the knowledge of God being strengthened with all power according to according to his glorious might so that you may have great endurance and patience. We are to be filled with the knowledge of his will but there is more. We are not simply to be filled, but there is a purpose- that you may live a life worthy of the Lord and may please him in every way, bearing fruit in every good work. What are the walls that surround me today? I’m looking up at them and thinking: God, I’ll never make it. How about you? Is there is something you cannot get over? A setback that you have suffered? Circumstances that have become monolithic, a massive wall that you cannot climb? Is there someone whose heart has hardened toward you, as Joseph’s brothers were hardened against him? Whatever the obstacles, these are the “walls” – hardships we will find the courage and grace to get over, to grow over, as we grow up in Christ. …we did not follow cleverly devised stories when we told you about the coming of our Lord Jesus Christ in power, but we were eyewitnesses of his majesty. He received honor and glory from God the Father when the voice came to him from the Majestic Glory, saying, “This is my Son, whom I love; with him I am well pleased.” We ourselves heard this voice that came from heaven when we were with him on the sacred mountain. 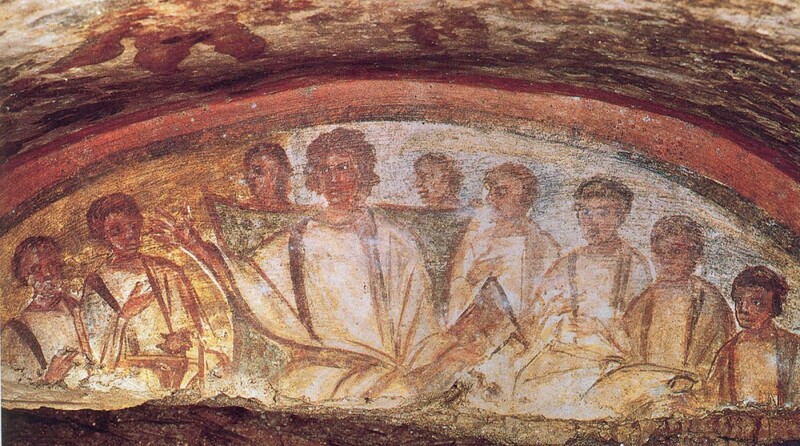 The Apostle Peter wanted his readers, and he wants us to know, that whatever the psychological benefits or explanations that one may give for the existence of Christianity, these things really did happen in history, in time and in space. He himself witnessed these things with his own eyes, ears, and heart. In his book, Future of an Illusion, Sigmund Freud, described what he believed to be the psychological foundation for believing in a God. It begins in early childhood. We experience feelings of helplessness. This long drawn out helplessness causes us to want the protection of our parents. These feelings carry over into our adulthood where we find ourselves confronted by the great forces of life. Freud writes, “He knows to be sure that he is in possession of greater strength, but his insight into the perils of life has also grown greater, and he rightly concludes that fundamentally he still remains just as helpless and unprotected as he was in his childhood, that faced by the world he is still a child.” Thus “he cannot do without the protection which he enjoyed as a child. …He exalts the image [of the father] into a deity and makes it into something contemporary and real.” In Freud’s thinking God is an idea we create to answer to our need for parental protection. He is simply an exalted father and this explains why young people lose their religious beliefs as soon as their father’s authority breaks down. There is much about which Sigmon Freud was right in his description of the unconscious process of transference- a tendency to displace feelings from authority figures in our childhood onto those in the present, thus distorting and causing conflict with present authority. These ideas has been proven helpful in clinical work. But what Freud never acknowledged was the possibility that he himself might be suffering from how much he had distorted the Ultimate Authority. He did not consider that his own view of God was not based on the God of history and Christianity, but his own neurotic distortion. Regarding the false teachers of Peter’s time, some were frauds, others might have been the Freuds of their time. They rejected the truth and replaced it with their own ideas. But Peter and his fellow apostles saw and heard the truth so that whatever neurosis we might have to suffer on this earth, we might not suffer the ultimate distortion of God. Christ’s power to equip us to live for him, the coming kingdom and the glorious future that awaits us, are all truths rooted in his historic appearance and the Father’s approval of him. As Peter says in Acts 4.20 …we cannot but speak the things which we have seen and heard. I believe in the communion of the saints …What are the implications of this belief? It means that I am ready to accept the practical consequences of being joined to all who worship God in truth. An example from the Old Testament illuminates the fixed nature of our relationship with others who believe. The Psalmist says in Psalm 119.63, I am a companion of all who fear you. He is acknowledging, in effect, that he is joined to all others who worship his God. The word – “companion” – bears a closer look. The Scriptures use this word to describe a closeness, an intimacy that is fixed and certain. When the curtains in the tabernacle in Ex.26.3 are described as being coupled to one another, it could be translated literally that they are “companioned to one another.” When the High Priest’s breastplate and ephod in Ex.28.7 is described, this same term describes how the shoulder straps are joined at its two edges. Literally, they are “companioned at its two edges.” The idea is that this fastening, this joining, of us to others of our faith, is very real and cannot be denied. Paul writes in 1Thess.4:9 that concerning brotherly love you have no need that I should write to you, for you yourselves are taught by God to love one another… This statement implies that our relationship with others of our faith is something we are given to understand and accept by the power of the Holy Spirit. But Paul’s statement also suggests that sometimes those consequences are difficult to accept, for example, when there is strife or disagreement. Paul says something similar to this in 1 Corinthians 1.10: Now I plead with you, by the name of the Lord Jesus Christ, … that there be no divisions among you, but that you be perfectly joined together in the same mind and in the same judgment. He doesn’t appeal to their appreciation of him. Not even an Apostle could prevent divisions in the church, but he appeals to them in the name of the Lord Jesus Christ. When we do not handle conflict and disagreement the best way, we want to pull away from others, from communion to disunion, to disconnect and to disassociate ourselves. But our new nature, born of God’s Spirit, should guide us: Whoever believes that Jesus is the Christ is born of God, and everyone who loves Him also loves him who is begotten of Him (1John5.1). Our desire for Christ, our love for him, is the foundation of our communion and empowers us not only to rejoice in our faith, but also recognize that we have been joined to others on the breastplate of our Great High Priest. I believe in the communion of the saints, the Apostles’ Creed states. The condition of our communion, for admission into the church, is belief in Jesus as the Divine Son of God. We must believe the claims Jesus made about himself, that he is the way, the truth, and the life. But we must never be arrogant about it. To the contrary, the chief characteristic of our communion is humility. Whether we are thinking of ourselves as part of a particular church, or the Church worldwide, our communion should be characterized by humility. God saves the humble (Ps.18.27). He guides the humble in what is right and teaches them his way (Ps.25.9). He crowns the humble with salvation (Ps.149.4). This is not a false humility but as the Church Father Clement put it, The lowered level of egocentricity and the humbled self-awareness that accompany sound Christian teaching arises out of a realistic consciousness of one’s actual ignorance, the limitations of one’s knowledge, one’s tendency to be deceived and one’s egotistic interpretation of the facts. Our humility is not pretend, but should arise out of a genuine conviction that, as human beings, we can act ignorantly, that we are easily deceived, and inclined to be very self-centered. All of you clothe yourselves with humility toward one another, because God opposes the proud but gives grace to the humble. Humble yourselves, therefore under God’s mighty hand…1Peter5.5-6. An attitude of humility should be put on like clothes every morning, because only then are we truly useful to our Master and able to fully experience the grace he has for us. I believe in the communion of the saints… The Apostles’ Creed states the basic beliefs of the Christian faith or the conditions for our communion. Chief among these beliefs is the divinity of Jesus and our acknowledgment of his exclusive claims. Jesus said, I am the way the truth and the life. No one comes to the Father except through me. John 14.6. And in the early church Christianity was frequently called, as it is in the Book of Acts, “the Way” (Acts 9.2, 19.9,23) Jesus is not one way among many to God, but the way. He is saying, in effect, I am the way (to the Father) in that I am the truth and the life. This goes against popular thinking that all major religions are equally valid and basically teach the same thing. In this line of thinking, it is arrogant to say your religion is superior and try to convert everyone else to it because surely all the religions are equally good and valid for meeting the needs of their particular followers. Some even think that religion is the major obstacle to world peace today, and that religion (and for purposes of this discussion we’ll allow that Christianity is a religion) should be outlawed or kept privately because it just separates people and makes them enemies because as they morally improve themselves they think they are superior to others. And Christianity can and does have this effect, if and when, it is reduced or perverted to the idea that we are to lead a good life so that we can go to heaven. But Christianity is not about this at all. Far from it! Jesus does not show us how to live so that we can merit salvation. He comes to forgive and save us through his life and death in our place. And our message can never be about hate or superiority when it is about him. Our message is about a man who died for his enemies, saying Father forgive them for they do not know what they are doing! When this is at the heart of our faith we cannot act in violence and oppression against others. Instead our calling is to lead a life of love that reflects what Jesus has done for us. But this is the condition and foundation of such a faith: that one not merely believe in Jesus’ humanity or goodness, but in the divine claim Jesus makes about himself, as the way to reconciliation with God that is his alone.